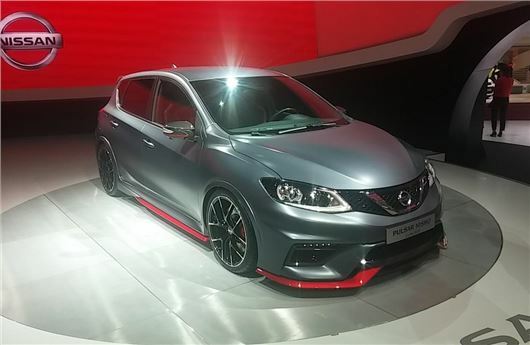 Nissan has given its brand new family hatch, the Pulsar, the sporty Nismo treatment – although there’s no word yet on whether or not the Pulsar Nismo will go into production. The Pulsar Nismo follows similar sporty treatments for the 370Z and Juke. It has a deep front bumper and aggressive sideskirts, as well as 19-inch alloy wheels. At the rear is a carbonfibre spoiler, twin exhaust and flared wheelarches. Inside, there are Alcantara-trimmed seats,red dials and a sporty three-spoke steering wheel. For now though, if you want a hot Pulsar, you’ll have to buy the 1.6 DIG-T 190. With 190PS and 240Nm of torque, it shouldn’t hang about. While we are waiting to get full performance figures and prices, we reckon it should return around 47mpg and emit 138g/km of CO2.